What is well known in the sword world is that blades by Muramasa (村正) were considered to be cursed or unlucky by the Tokugawa family. In this chapter I would like to shed a little more light on the circumstances and introduce the various cases which were the basis for this superstition. It all started with Tokugawa Ieyasu´s grandfather, Matsudaira Kiyoyasu (松平清康, 1511-1536), the 7th generation of the Mikawa-Matsudaira line (三河松平) and lord of Okazaki Castle (岡崎城). The arch rivals of the Matsudaira were the Oda (織田) of neighbouring Owari province and so, in Tenbun four (天文, 1535), Kiyoyasu decided to attack Moriyama Castle (守山城)*1 which was held by Oda Nobumitsu (織田信光, 1516-1556). When the Matsudaira army of about 10.000 men set off, a rumour started to circulate that Abe Sadayoshi (阿部定吉, 1505-1549) – a retainer of the Matsudaira – was secretly communicating with the enemy. Kiyoyasu did not listen to these rumours but Sadayoshi tried to prove his loyalty and called for his son Yashichirō Masatoyo (弥七郎正豊, ?-1535). It was also assumed that Sadayoshi feared that Kiyoyasu had already sent a squad to execute him and so he gave his son the order: “As a sign of my loyalty it would be best if you kill me to dispose of this matter once and for all!” Masatoyo was not able to get a wink of sleep after receiving even the written order from his father. When morning finally broke he heard neighing horses and thought the bailiffs were faster than him and that the execution was already in progress. He jumped out of his bed, grabbed his sword lying next to his cushion and started running so that he was even able to somehow fulfil his father’s wishes and to protect the honour of the family. On his way to Sadayoshi´s room he came across Kiyoyasu and drew his sword as in trance: “If you had trusted my father, then he would have stayed alive!” Instantly he delivered a blow towards Kiyoyasu and the latter yelled: “Masatoyo, have you turned completely mad? !” The strike severed his earlobe. When Kiyoyasu turned around to escape the situation he was fatally hit by Masatoyo´s second blow. With a smooth and clean cut his blade entered Kiyoyasu´s right shoulder and left the body at the left hip. *2 Upon this Masatoyo was killed by Kiyoyasu´s companion Uemura Ujiaki (植村氏明, 1520-1552). Well, the misfortunes of the Matsudaira family connected to Muramasa blades continued with Kiyoyasu´s son Hirotada (松平広忠, 1526-1549). On a balmy spring night he was woken up by the vibrations of the steps in the hall that he felt on his cushion. He opened his eyes and was able to catch a glimpse of a shadow. Immediately he grabbed his sword and shouted: “Scoundrel, stop!” When he heard more steps and tried to run in that direction he noticed that he had no more control of his legs. He looked down and recognized in fear that his clothes were blood-soaked. Hirotada was able to follow the figure into the garden. At that time, the aforementioned Uemura Ujiaki was on guard duty on the veranda. “Stop that man!,” was Hirotada´s order. After a moment of shock realising that his lord was in danger he drew his sword and chased after the man and killed him. The dead body was examined and they saw that he had only one eye, which was actually a good starting point for further investigations. It turned out that the man was a certain Iwamatsu Hachiya (岩松八弥) and that he was obviously completely drunk that evening. These were so to speak mitigating circumstances but some of Hirotada´s retainers said that he was an assassin sent by the enemy and that the intoxication was part of the plan to obscure the backgrounds. But the high level of alcohol had probably saved Hirotada´s life. However, Iwamatsu was a retainer of the Matsudaira who had lost an eye in battle and who was known for his ferocity. He also had a remarkable list of taken heads. When they removed the handle from his sword – it was a wakizashi – the signature „Muramasa“ was revealed. The misfortunes with the Muramasa blades also passed on to Tadahiro´s son Tokugawa Ieyasu. After his father’s death, the seven years old Ieyasu – his name then was Matsudaira Takechiyo (松平竹千代) – was sent as a hostage*4 to the Imagawa family (今川), who were military governors of Suruga province and the arch rivals of the Matsudaira in terms of supremacy in that area. One day, using the kozuka of his katana, he injured himself. The cut was not that deep but unnaturally painful. He cleaned the blood from the blade and could not believe his eyes: It was signed “Muramasa.” So his grandfather was killed by a Muramasa sword, his father almost, and now it was his turn. Ieyasu strongly believed that this was no coincidence and this became firmly fixed in his mind. Years later Ieyasu married Tsukiyama-dono (築山殿, 1542-1579) to strengthen the bond between the Matsudaira and the Iwamoto. 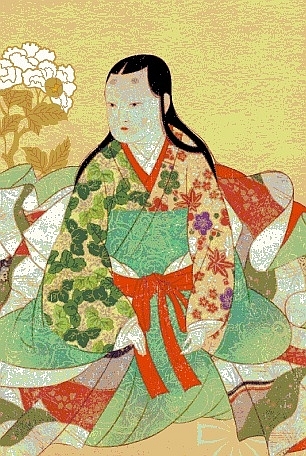 Tsukiyama-dono was the daughter of the Iwagawa-retainer Sekiguchi Chikanaga (関口親永, 1518-1562) and the younger sister of Imagawa Yoshimoto (今川義元, 1519-1560). But when Ieyasu engaged in an alliance with the Imagawa’s arch rivals, the Oda, the family of his wife was not particularly happy. By the way, Ieyasu needed the Oda to fight against the Takeda (武田). In the chaos of the war back then, Oda Nobunaga raised the suspicion that Tsukiyama-dono and her first son with Ieyasu, Matsudaira Nobuyasu (松平信康, 1559-1579), were in cat hoods with the Takeda. As a “logical” consequence and in order not to endanger the alliance with Nobunaga, Ieyasu ordered the execution of Tsukiyama-dono and the ritual suicide (seppuku, 切腹) of his son Nobuyasu. Tsukiyama-dono was executed by Ieyasu´s retainer Nakano Shigemasa (野中重政)*5 on the 29th day of the eighth month of Tenshō seven. The time for Nobuyasu came somewhat later, on the 15th day of the ninth month of that year. His second (kaishaku, 介錯) was his close friend Hanzō Moritsuna (服部半蔵守綱), but when he raised his sword he burst into tears. So the Imagawa-samurai Amagata Michioki (天方通興), who was actually the official witness of the ceremony, stood in. In this function, he was only armed with a wakizashi at that moment and, have a guess, the blade was a Muramasa! This strengthened Ieyasu’s paranoia: His grandfather, his father, himself and his son were either killed or injured by Muramasa blades. So he called for his chamberlain and, according to tradition, ordered that works of this smith should disappear from the face of earth once and for all. After Sekigahara, the victorious side of the Tokugawa made a full investigation of the battle in order to carry out the correct rewards and punishments. In one of these investigations, the deeds of Oda Nagataka (織田長孝, ?-1606) were assessed. Nagataka was the son of Nobunaga´s brother, the famous tea master Oda Urakusai Nagamasu (織田有楽斎 長益, 1548-1622). In a battle Nagataka had killed the enemy commander Toda Shigemasa (戸田重政), namely in close combat by entirely piercing his helmet with a yari. The yari remained completely intact and was shown upon request to Ieyasu. “A truly masterly spear,” he said, but he dropped it and cut his hand. “Ha! Must be a Muramasa,” Ieyasu said jokingly and the present Urakusai replied with a serious face: “Yes, it is indeed a work of Muramasa.” “You know that blades by that smith are unlucky for the Tokugawa, don’t you!” “If so, I will never ever wear a sword from Muramasa again,” promised Urakusai, broke the shaft of the spear into two halves and threw it aside. Incidentally, another tradition says that Nagataka cut through the shaft of the yari with his wakizashi. But the misfortunes with Muramasa blades continued even after Ieyasu´s death. Tokugawa Tadanaga (徳川忠長, 1606-1633) for example, the younger brother of the third Tokugawa-shōgun Iemitsu (徳川家光, 1604-1651), committed suicide with a Muramasa-tantō. But not out of mysterious or unexplainable reasons. Already in the eighth year of Kan´ei (寛永, 1631) he was placed under house arrest because of improper behaviour – he had killed a (according to other traditions several) vassal(s). One year later he spread unfounded rumours concerning the then punishment of Katō Tadahiro (加藤忠広, 1601-1651) by the bakufu. For this, all his land was confiscated and the Tokugawa government suggested that he should commit seppuku. On the evening of the sixth day of the twelfth month of Kan´ei ten (1633) he ordered his page to bring sake and prepare dinner. When the latter returned to the chamber of his lord he saw him sitting completely dressed in white and leaning forward a bit. But when he took a closer look he saw that the white of his dress was mixed with red. He came closer and realised that Tadanaga was dead and that his Muramasa-tantō was stuck halfway in his throat. As indicated before, Ieyasu placed a quasi “Muramasa ban” but it seems that this was not so strictly monitored by the bakufu. Even in the list of Ieyasu´s estate*6 we find a Muramasa blade and in the sword chronicles of the Mito-Tokugawa family we find two katana and three yari by this smith. Another example. The Kyōto sword polisher Imamura Yukimasa (今村幸政) kept record of all the blades he had inspected and polished. In this Rekikan Kenshi (暦観剣志) protocol we find, for the Bunka era (文化, 1804-1818) alone, ten Muramasa blades given to him for a new polish. That means it was actually not that strictly forbidden to own or carry around Muramasa blades. But we can safely assume that they did not like to see an ally or a close retainer wearing a Muramasa sword because things might turn against them because of their “harmful power.” It is also known that the Tokugawa did not accept a Muramasa as an appropriate sword present. In the first volume of the Legends and Stories around the Japanese Sword I described the financial problems many samurai were facing from the mid to the end of the Edo period. So if one owned a Muramasa and had no other choice to wear or present this sword, he made do with an “emergency solution.” Such a solution was to carry out a so-called kaisan (改鏨, lit. “change of chiselling’s”). There are many Muramasa blades where one of the two characters for Muramasa (村正) was removed or altered (see picture below). In most cases the character for Mura was removed and, for example, the character hiro was added underneath Masa to obtain Masahiro (正広). Other possible combinations were Masamune (正宗), Muratada (村忠), Muramune (村宗) or Hiromasa (広正). But there were also those who wore Muramasa blades on purpose because they were adhered opponents to the Tokugawa regime. This concerned first and foremost the end of the Edo period when the grievances against the inability of the bakufu spread amongst many daimyō. One of the first who used Ieyasu´s superstition against him was Sanada Yukimura (真田幸村, 1567-1615). He was famous for winning battles while being greatly outnumbered. When Sekigahara started, he sided with Ishida Mitsunari (石田三成, 1560-1600) because he thought he could gain more if the Western Army won. But Yukimura´s brother Sanada Nobuyuki (真田信之, 1566-1658) sided with Ieyasu so that the Sanada clan would survive regardless which side was victorious. There is another anecdote about the Confucian, physician and convinced royalist Tomita Taihō (富田大鳳, 1762-1803) who was teaching at Higo´s Saishūkan (再春館) medical school. He complained about the weakening Imperial court and visited one day a sword dealer. “I am looking for a Muramasa sword. Money is no object!,” he said. Because money was no object, it was easy for the dealer to get him a splendid daishō by Muramasa. Taihō was overjoyed and celebrated his new acquisition with a lot of sake. Later, and obviously drunk, he talked to his sword: “Well my Muramasa. You waited long enough in your scabbard. I have a great task for you because you shall decapitate the shōgun!” However, Taihō never put that into practice but he played a major pioneering role for the later royalist party (kinnōtō, 勤王党) of Higo´s Kumamoto fief (熊本藩). brings the cold water to shine. This poem alludes to the famous words of Jìng Kê (荊軻, ?-227 BC). He is renowned for his failed assassination attempt on King Qín Shîhúang (秦始皇, 259-210 BC). On the way to the Qín capital he sang: “Piercing wind, freezing river of Yì. The hero fords, and never returns!” (kaze shōshō- toshite ekisui samushi, sōshi hitotabi satte mata kaerazu, 風蕭蕭兮易 水寒・壮士一去兮不復還). When he went for an audience with the king he had a poisoned dagger concealed inside a map. When the king opened the map revealing the dagger, Jìng Kê seized it and attacked the king, who was briefly unable to draw his own sword. One of those present, a doctor, grabbed a medicine bag and attacked Jìng Kê, whereupon the King drew his sword and wounded him. Later, the assassinator was eventually killed by the guards. This means that Takamori considered this little tantō as a subliminal message of resistance against the Tokugawa regime. 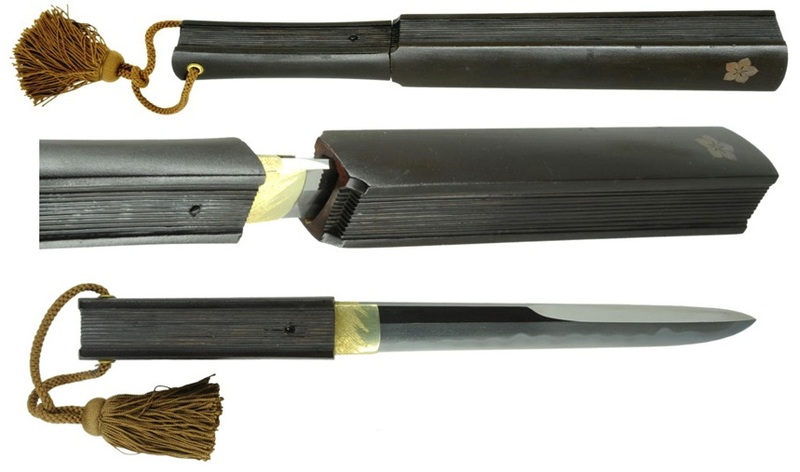 Incidentally Beppu Shinsuke (別府晋介, 1847-1877), the kaishaku at Saigō Takamori´s seppuku, wore a Muramasa wakizashi but the signature was not authentic (gimei, 偽銘). Example of a tantō mounted as a tessen. In order to not miss out swords I would like to introduce at the end of this chapter a jūyō-bijutsuhin katana by Muramasa (see picture below). It was once the favourite sword of Nabeshima Katsushige (鍋島勝茂, 1580-1657), the first daimyō of the newly founded Saga fief (佐賀藩) of Hizen province after Sekigahara. The Nabeshima actually sided with Mitsunari but did not participate in any of the major battles of Sekigahara and were able, by negotiating through the Ieyasu-ally Kuroda Nagamasa (黒田長政, 1568-1623), to be spared. Katsushige and Nagamasa had fought side by side three years before at the siege of Ulsan (蔚山) in Korea. 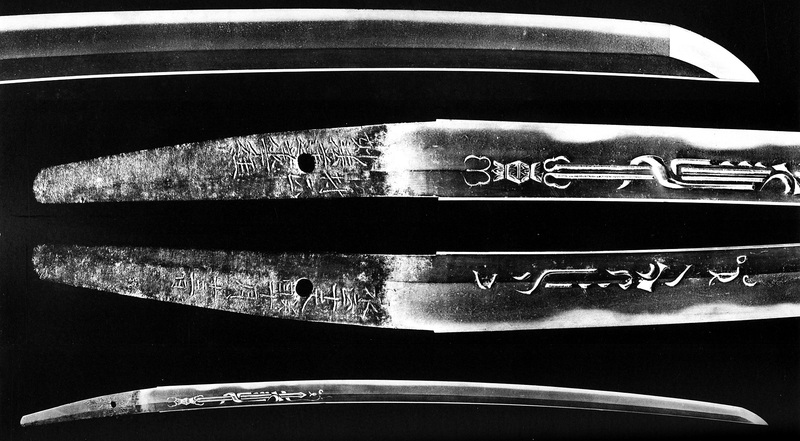 The katana bears on the back of the tang the ginzōgan inscription “Nabenobu” (鍋信) which is an abbreviation for “Nabeshima Shinano no Kami” (鍋島信濃守), the family name and honorary title of Katsushige. The actual signature of the sword reads: “Muramasa – Myōhō renge kyō – Eishō jūten mizunoto-tori jūgatsu jūsannichi” (村正・妙法 蓮華経・永正十天癸酉十月十三日, “13th day of the tenth month of Eishō ten , year of the rooster”). The 13th day of the tenth month was the day of the death of the great Buddhist reformer Nichiren (日蓮, 1222-1282). Namu myōhō rengō kyō (南無妙法蓮華経, “Glory to the Sutra of the Lotus of the Supreme Law!”) is the main Buddhism mantra practiced by Nichiren and his followers. The Japanese name daimoku (題目) for this mantra gave the blade its nickname, Daimoku-Muramasa (題目村正). *8 On the basis of the signature and the date – which was obviously not chosen coincidentally – we can assume that Muramasa was also a follower of Nichiren-Buddhism too. Katsushige gave the blade to his eldest son Motoshige (鍋島元茂, 1602-1654) whom was given in Kan´ei 19 (寛永, 1642) the newly founded Ogi fief (小城藩) of Hizen province. Motoshige was a great swordsman and was trained by the famous master Yagyū Munenori (柳生宗矩, 1571-1646). Incidentally, at the end of the Edo period, there was a smith called Shigehide (重秀) working in the neighbouring Ōmura fief (大村藩). His civilian name was Hayashi Tamon (林多門, ?-1872). He had studied in Edo under the master Taikei Naotane (大慶直胤) and focused on copies of Muramasa blades. Contemporary reports say that these copies were very popular among Nabeshima-samurai because Muramasa swords has been admired there since the time of Katsushige. *1 The castle is also noted in contemporary chronicles with the characters (森山城). It was erected in front of the Owari main castle Kiyosu (清洲城) to intercept possible attacks. *2 Such a diagonal cut across the body is called “stole cut” (kesagiri, 袈裟斬り) because it roughly follows the hem of the stole of a Buddhist priest. *3 The oldest extant dating of a Muramasa blade is from the first year of Bunki (文亀, 1501). *4 The practice of “human pledge” (hitojichi, 人質) was a common practice during the Sengoku period. Most of the influential warlords had sons, daughters and/or wives more or less permanently staying at the mansions of allies. *5 According to tradition, Shigemasa returned to his home village (堀口) after executing this command. There he lead a secluded life. When two deaf-mute daughters were born later into the Nakano family, it was believed that this was the curse of Tsukiyama-dono. Thereupon the family erected several stone lanterns in front of her mausoleum as a kind of compensation. These stone lanterns are still in existence. *7 Yukimura erected a small fort on the south-western corner of Ōsaka Castle. *8 It is also nicknamed Myōhō-Muramasa (妙法村正).